Just want to let you know that I am still alive and well. I have been working on other projects and haven't made time to post anything ...only responding to questions on YouTube. I have been meaning to post a video on how to use MyPaint 1.1 on Windows, but in that time people have been creating builds that will do the same, with less steps. What I was really looking at MyPaint for was an easy, low resource app that I could you for sketching, which is was with 1.0. But version 1.1 add Mirroring tool which is a very useful tool when one is working out ideas before committing to a specific design. Of course they also included a slew of various built in color pallets, wheels and tools and Gamut masks (very cool), along with blending options and a frame tool that will limit to area for composition. An unlimited drawing area is one of the most attractive aspects of MyPaint that a lot of people are unaware of. One can start drawing and keep expanding the drawing area simply by moving the screen, so no more running off the paper again. So by using the Frame tool, one can limit the size of the canvas. For a thorough overview of the features go to David Revoy's blog HERE, He did a great job on covering all of the features when it was first released on Linux. When you download any of these builds for Windows they will be in a zip file. I use 7zip to unzip them into a separate folder and then create a short cut to the .exe file within that folder to run the program. 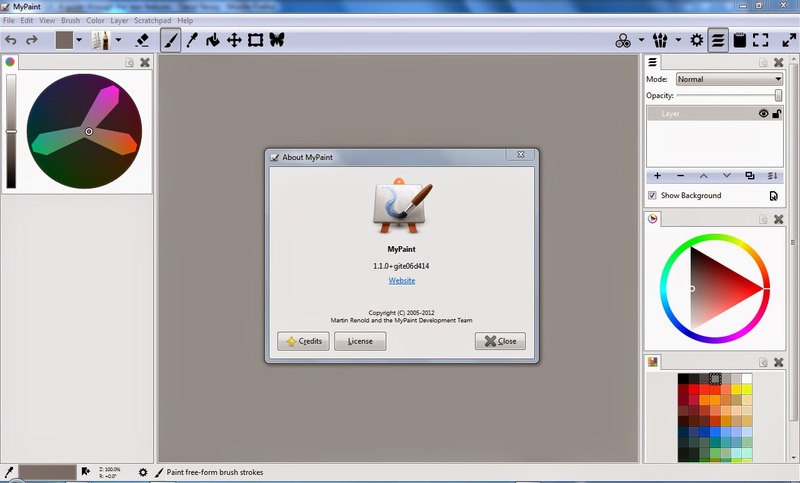 You won't be installing MyPaint but merely running it. This is an added bonus allowing to run multiple versions of MyPaint. To get the newest version for Windows and read TumaGonx Zakkum's blog on MyPaint, you can find his blog HERE or the direct link to DOWNLOAD MyPaint 1.1. Keep in mind that MyPaint is a free open source program that is quiet capable of many tasks and I hope you give it a try. You can do more that just sketch with as you can see from David Revoy's examples. I plan to do some sketching examples in a future post, but for now, just give it a try and see what you can come up with.